Good morning polished world! How are you all doing today? I really wasn't in the mood to create a post today, but here I am! I've been exhausted lately and this was the only manicure that I had edited and ready to go. I feel like I never got over the whole exhaustion from last week. This week already is off to the same exhausting start. So much so that I don't have nail art on my nails and it's been five days without it. I feel naked. Today's design is one I did a week or so ago when I was feeling uninspired and just wanted a quick simple manicure. 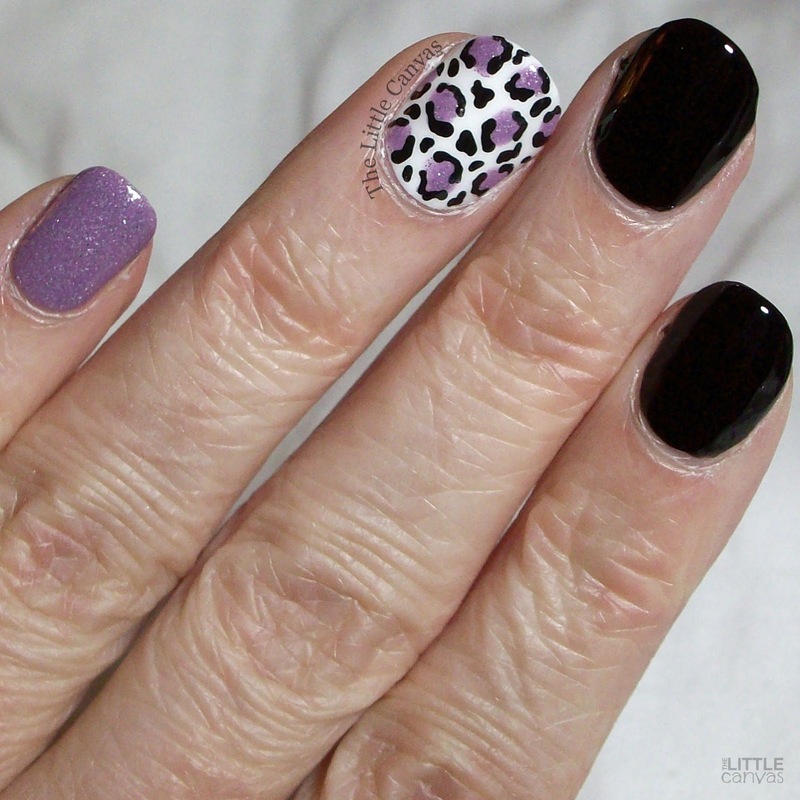 It's been a long time since I've done a leopard design, and they are by far the easiest ones to do. Also, you know I've been obsessing over my Zoya Pixie polishes, so it's no shocker that I used one for this design. Pretty sure I use ORLY White Tips and Liquid Vinyl in all my manicures. I've had to stop tagging ORLY in the posts that use these polishes because all 995 posts would be tagged. Yeah, can you believe that? I'm close to 1,000 posts on this little blog. I'm sure that there are a lot of bloggers with triple the amount, but hey, I'm proud for making it this far on my blog. Totally got off topic there for a second. ORLY Liquid Vinyl and White Tips pair beautifully with Zoya Stevie. This is one of my all time favorite polishes. It's a light, lavender, sparkly Pixie which reminds me of my Great-Grandmother. This lavender was her favorite shade of purple. I don't use it nearly enough. What do you think? Fan of this manicure? Loving the Pixie Dusts?